Ground your business around Activities and realize that we all face procrastination at some point. If you are sitting in your office spending hours rearranging your desk, and you do that too often, then you are not prospecting enough. Real Estate is about stirring the pot and causing conversations; and on those days when the phone is not ringing, leads are not flowing to your mailbox, maybe you put on your badge, grab lots of business cards, and start canvassing your neighborhoods. You should probably design a better long term plan of action, but sitting on your couch, or at the office lamenting the lack of business will NOT advance you a bit. The more you choose to be active and engage others about their Real Estate Needs the more business will find its way towards you. Keep this simple quote in mind: ‘People love chopping wood. 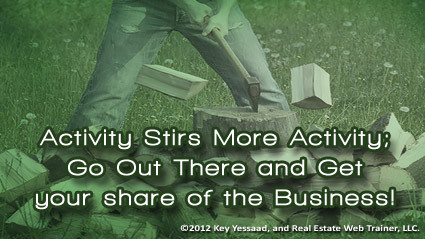 In this activity one immediately sees results.’ – Albert Einstein.